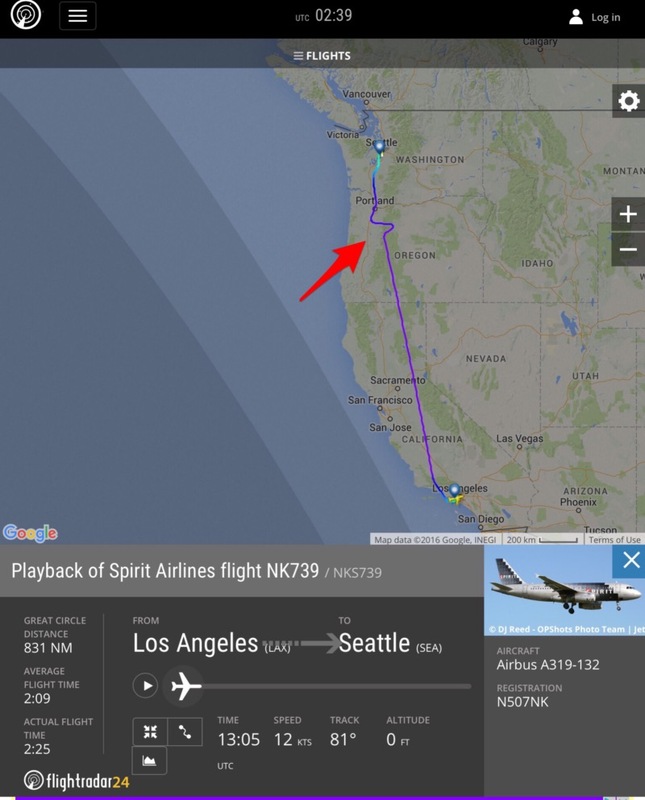 I was tracking flight NKS739 from LAX to SEA this morning and saw that it made some some odd turns. If you look at the track from FlightRadar24.com you can see that it was heading toward SEA then it took a large turn to the right then to the left then returned to its original course. This does not look like the usual technical glitch from Flightradar24, and FlightAware shows the same track. There was no weather anywhere in the area. There were many aircraft in the area at the time and none of them made any unusual turns. There are no MOA's in the area (most of it is over a national forest) and none of the other aircraft seem to be avoiding anything in the area. I tried to see if LiveATC.net had a recording but that's Seattle center's area and they don't appear to have a feed for ZSE. I can't come up with any reason for such an odd deviation. The aircraft arrived in SEA and there didn't seem to be any problem. It immediately turned around and made another flight which was uneventful. Is there anything that might explain this deviation? Is it just a glitch? Alrighty then, that took some detective work. Here's another flight around the same time, SkyWest 4458, which arrived 2 minutes later. Notice it's one deviation, compared to two deviations in your example. Weather seemed fine, but KSEA has TBFM (Time Based Flow Management) since Aug 2013. If the ATC asks a plane to delay its arrival time, the way it's done is to deviate from the route, then get back on it again—that's if slowing down alone won't meet the time target. Pilots then use the RTA (Required Time of Arrival) function of the FMC. Initially the function was rarely used, but now with NextGen in the U.S., SESAR in Europe, and similar systems elsewhere, it is frequently used. It can be arranged way ahead of the airport, i.e., it can be ordered by the approach controller, yet the center controller of another ARTCC delivers the message. It looks exactly like that. Deviate, if not enough, deviate the other way. The system is called ERAM (En-Route Automation Modernization). ERAM detects future conflicts, and based on that, traffic is asked to speed up, slow down, or deviate to slow down further. It reduces/eliminates hold time. Europe—the first to use it in 2012—refers to it as initial 4D trajectory management. Planes arrive at waypoints at agreed times. For whatever reason—most probably sudden traffic influx—they were asked to slow down. The difference between this, and the regular vectoring/doglegging in the terminal area, is the way it is predicted, coordinated, and then relayed to airplanes far from the airport. Below you can see as the jet turned, it slowed down as well. 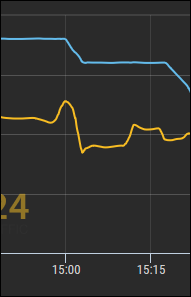 The initial upward spike is just the tailwind when the plane turned. Speed reduction works, but only when the distance to travel is still long. And even then it can only absorb a few minutes as the minimum speed of aircraft is still quite high. At very low speeds the fuel consumption increases drastically, making slow flight unattractive. Increase of path length is more versatile, it allows for much more time to be added to the flight (fuel is the limiting factor). Basically two types of path lengthening are used: holding patterns and dog legs. In a holding pattern, ATC can stack multiple aircraft on top of each other. A full circuit in a holding pattern takes about 5 minutes so it is a way of absorbing much delay. When not so much delay is needed, the dog-leg is preferred. By vectoring the aircraft 30 - 60 degrees off-course and then back to the original track, the controller can accurately control the delay and spacing between aircraft. This is used in the initial approach phase and when vectoring to the final approach. Often it is used in combination with speed control; slow flight reduces the size of the dog-leg. However, airlines prefer to fly the optimum endurance speed during such a phase to minimize fuel consumption. In case of the flight you were tracking, the aircraft was vectored right of its track, then back to cross to the left of its original track and finally back onto the original track. The added distance was approximately 65 nautical miles, which would be about 11 minutes extra flying time. DeltaLima hits the mark. I used to work there. Undoubtedly traffic management delays going on for some reason, either too much traffic or reduced runway capacity. TBFM issued directly to the aircraft is still in the early stages. I believe most delays are managed by the controllers vectoring, holding or issuing speeds. BTW- speeds are only effective for absorbing very small delays because it takes too much time to work. Old ATC rule; use vectors to get your spacing, speed to keep it. The "dog leg" vectoring going on looks like it's occurring in the second tier sector, sector 46 (two sectors away from the approach control boundary). The first tier sector may have been at capacity forcing the delays to be pushed out to the high altitude sectors. FYI - we used to figure about 5 minutes for one turn in hold. Holding needs to be handled at lower altitudes just to keep the plane in the box. I saw someone issue a hold to a 747 at FL390 once and it took the better part of the state to complete one turn! Not the answer you're looking for? Browse other questions tagged air-traffic-control flight-planning or ask your own question. At what point during a long flight do commercial airliners have the best gas mileage? What are the negative associations with Continuous Descent Approach? How is the effect of wind on arrival time handled? 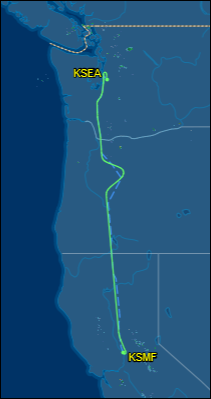 Why did this aircraft re-route? Is there any combination of aircraft and airports where no alternate landing airport would be possible? Why do some towers reference departures by compass direction, others by leg of pattern? Why did my transatlantic flight meander off the great circle?